SHADOWHUNTERS - "What Lies Beneath" - The Shadowhunters try to track down the new imposing threat, while Jace has a suspicion that Jonathan is back and behind the mundane attacks. Simon tries to figure out what The Seelie Queen did to him during his time in the glade. Alec decides to host a Lightwood family dinner at MagnusÕ house after a surprising visit from Maryse. This episode of "Shadowhunters" airs Tuesday, April 3 (8:00 - 9:00 p.m. EDT) on Freeform. (Freeform/John Medland) MATTHEW DADDARIO, HARRY SHUM JR.
We’re just a couple of days away from a brand new Shadowhunters! Freeform has released a synopsis and photos for the third episode of season 3 of Shadowhunters, titled “What Lies Beneath,” which finds Jace following a hunch that Jonathan is back, Simon trying to figure out the Seelie Queen, and a Lightwood family dinner. SHADOWHUNTERS – “What Lies Beneath” – The Shadowhunters try to track down the new imposing threat, while Jace has a suspicion that Jonathan is back and behind the mundane attacks. Simon tries to figure out what The Seelie Queen did to him during his time in the glade. Alec decides to host a Lightwood family dinner at MagnusÕ house after a surprising visit from Maryse. This episode of “Shadowhunters” airs Tuesday, April 3 (8:00 – 9:00 p.m. EDT) on Freeform. (Freeform/John Medland) MATTHEW DADDARIO, HARRY SHUM JR.
SHADOWHUNTERS – “What Lies Beneath” – The Shadowhunters try to track down the new imposing threat, while Jace has a suspicion that Jonathan is back and behind the mundane attacks. Simon tries to figure out what The Seelie Queen did to him during his time in the glade. Alec decides to host a Lightwood family dinner at MagnusÕ house after a surprising visit from Maryse. This episode of “Shadowhunters” airs Tuesday, April 3 (8:00 – 9:00 p.m. EDT) on Freeform. (Freeform/John Medland) MATTHEW DADDARIO, NICOLA CORREIA-DAMUDE, HARRY SHUM JR.
SHADOWHUNTERS – “What Lies Beneath” – The Shadowhunters try to track down the new imposing threat, while Jace has a suspicion that Jonathan is back and behind the mundane attacks. Simon tries to figure out what The Seelie Queen did to him during his time in the glade. Alec decides to host a Lightwood family dinner at MagnusÕ house after a surprising visit from Maryse. This episode of “Shadowhunters” airs Tuesday, April 3 (8:00 – 9:00 p.m. EDT) on Freeform. (Freeform/John Medland) HARRY SHUM JR.
SHADOWHUNTERS – “What Lies Beneath” – The Shadowhunters try to track down the new imposing threat, while Jace has a suspicion that Jonathan is back and behind the mundane attacks. Simon tries to figure out what The Seelie Queen did to him during his time in the glade. 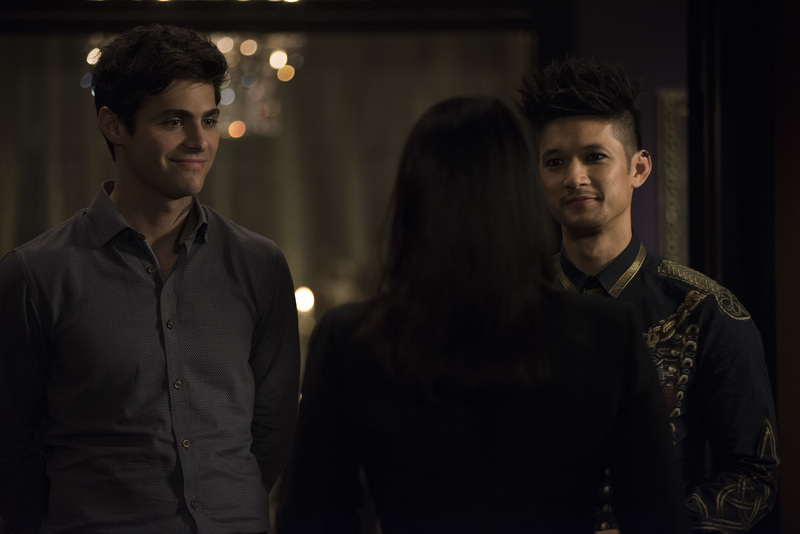 Alec decides to host a Lightwood family dinner at Magnus’ house after a surprising visit from Maryse. This episode of “Shadowhunters” airs Tuesday, April 3 (8:00 – 9:00 p.m. EDT) on Freeform. (Freeform/John Medland) NICOLA CORREIA-DAMUDE, MATTHEW DADDARIO, HARRY SHUM JR.